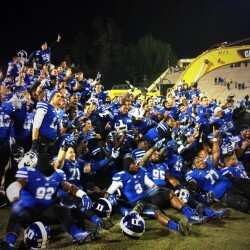 What a memorable year for Duke Football! GoDuke.com, powered by Super Dave Harding, did an incredible job bringing us closer to the action in a fun way all year long. But as my daughter Abigail and I reflected back on the season, we thought of a number of important details that they didn’t have time to share. So as a public service to #DukeGang, here we go. 1) Duke Students have a LONG way to go before they’re giving this team its due. Since we were driving up from Atlanta for the Spring Game, we gave ourselves plenty of time and naturally arrived early for the game. Abigail was thrilled that we got to sit in the FIRST ROW! As the game approached, a handful of students sat beside us and warned us ominously, “Just want to let you know that this is the student section and it’s going to get LOUD!” We decided to assume the risk (Abigail is loud anyway), and remained in our se ats. The students that did come to the game were very enthusiastic, but the total never topped a DOZEN students. That’s 0.18% of the undergraduate population – OUCH. As the season wore on, there was increased student support (especially for the first quarter of the UNC game), but it ought not to be so hard. Hopefully, Duke won’t have to come up with the modern equivalent of ‘Diskette Day’, when Carnegie Mellon gave our free computer disks to its students to get them to come to their 1987 Homecoming Game. The Spring Game was when Abigail’s fandom reached new heights, because after the game you are able to come on the field and talk to the players. (Abigail: “I’m so nervous – I’m physically shaking!!!!”). 2) Our Long Snapper is Awesome. Now having learned that the players are REAL PEOPLE, Abigail was desperate to attend “Meet the Devils”, a pre-season event where the entire team is made available to meet the fans and sign autographs. I was skeptical if the event was worth the drive, so I devised a scheme to avoid it. I told her that I would only go if I had assurances that my mini-Duke helmet would get signed by Coach Cut. I had dreamed of such a thing for a while, and I couldn’t imagine a way that I could be given such an assurance. In a matter of minutes, Abigail proudly thrust her iPhone at me. 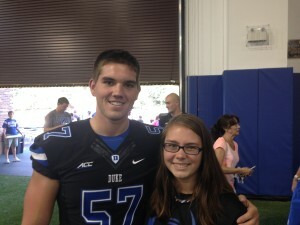 Turns out she had texted Thomas Hennessy, the Duke long snapper, who replied that Coach Cut would be at the event and would surely sign my helmet. WHOA! My helmet in fact DID get signed at Meet the Devils, and a healthy fascination with the critical role of the long snapper was launched. During each punt, field goal, or extra point attempt, we focused on the quality of the snaps – they never wavered. The consistency was remarkable. The great seasons for punter Will Monday and placekicker Ross Martin rest solidly on the great performance of Thomas Hennessy. 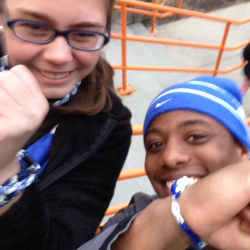 3) Some People really DO like Rubber Brand Bracelets (especially in Duke colors). Now that Miley Cyrus has gone skanky, teenage girls needed to discover a new craze. Turns out Rainbow Loom was it. Abigail has one of the over 8 MILLION units of this rubber brand craft contraption that have been sold, and really enjoys making bracelets while she’s watching history documentaries (most of that last sentence is true). 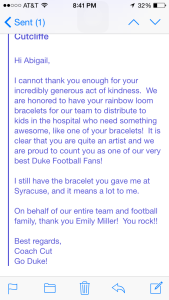 She told me she planned to make some bracelets for the players – she ignored my scoffing and made a set to take to Meet the Blue Devils. I’l be darn, but players seemed to genuinely like getting them – at least they liked the sentiment. 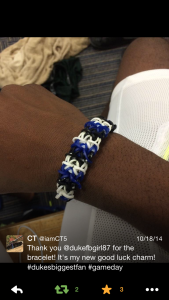 So throughout the season, Abigail kept making bracelets for her favorite players. She got the idea of making a bunch of them that the team could give out to kids in the hospital, and dropped them off at Coach Cut’s office. 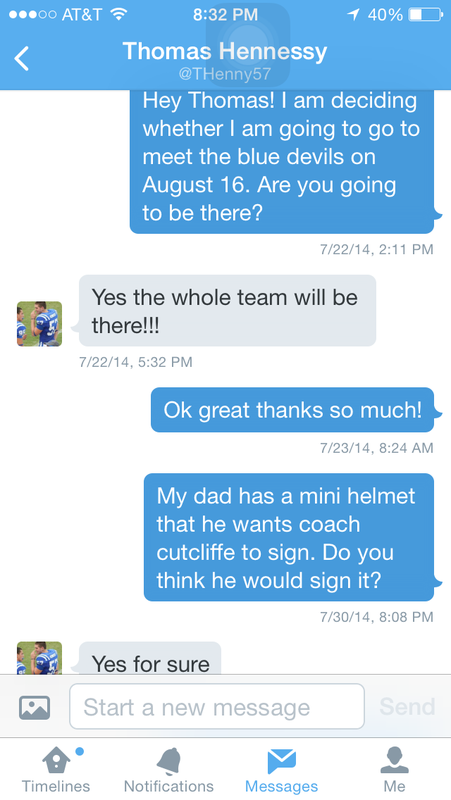 4) Coach Cutcliffe’s family is never far from his mind. 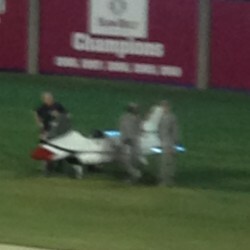 The coach graciously sent Abigail an email thanking her for the gift. Notice how he addresses her by the end of the message. It turns out that he has a daughter named Emily. Aha! Perhaps he was thinking of his family during my FAVORITE Coach Cut moment of the year – when he dissed Paul Johnson! Where did that come from? Whatever the source, I say keep it coming. We went on to beat Georgia Tech for the signature win of the year. 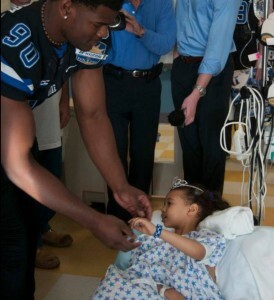 Those bracelets did ultimately find very worthy recipients at El Paso Children’s Hospital during Sun Bowl Week. Chris Taylor and Zavier Carmichael described the visit. 5) Weird things happen in Troy, Alabama. One of the highlights of the year for us was the away game at Troy. The largest provider of college-level training to the US Military turns out to be a beautiful school that just kind of pops out of nowhere. Also, there was an extended break in the second half – eventually there was an announcement made that simply “The Press Box has been Evacuated”. Huh? 6) Clemson gives the best post-game food. College football brings it with a number of customs and traditions (my favorite is the state trooper escorts for the coaches). At Troy, we learned that it is the obligation of each home team to provide the away team with food after the game. Troy gave each Duke player a box from Chick-fil-A. Dean Sue informed me that in her many years of traveling with the team, the best food comes from Clemson – a large Dominos pizza for everyone! 7) If you want to REALLY know the truth about a player, ask ‘Granny’. As you might expect, there is no more loyal group of fans than the family members of the players. What you might not expect is the size of the contingent – what a great team support group! We had fun chatting with these folks before or after games, and came to discover that they see their kids as just that, kids. We learned that one player didn’t like contact; another has always been very lazy; yet another studied all the time in High School – thank God he’s now got a girlfriend in college! 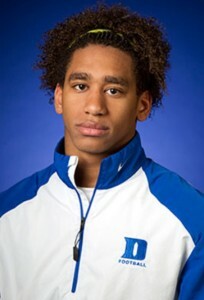 9) Cutting funky hair won’t prevent you from going to a b owl (but might make it hard to win one) Abigail quickly determined that the BEST hair on the team was that of Evrett Edwards – not even close. We looked forward to any time that Evrett got onto the field with his magic hair. The week before the Sun Bowl Abigail told me we had a BIG problem – Everett cut his hair! Why?! Dave, the people want to know. At the Sun Bowl, Evrett made a great interception at the end of the first half – the call was overturned. That call could have been the difference in the game. Was it because of his now boring hair? Likely. 10) If you see a player(s) go to the bathroom, they might not actually have to go. In the second half of the Sun Bowl, I noticed Hennessy and Will Monday going to the locker room during the game – I commented to Abigail how sweet it was that the long snapper was going with the punter to the bathroom, so he wouldn’t have to go by himself. Little did I know…. 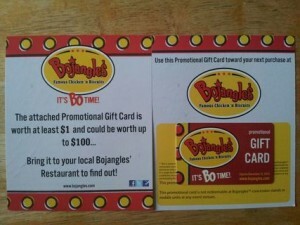 Will Monday then came up with one of the greatest plays of the season – an awesome fake punt toss to Johnell Barnes! Afterwards I learned from Hennessy’s dad that they went into the locker room for Will to warm up his arm – and they didn’t want to practice in front of ASU. Amazing! Great job in 2014, guys. 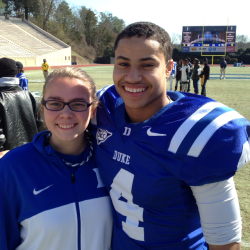 Can’t wait for Duke Football 2015! Go Duke. 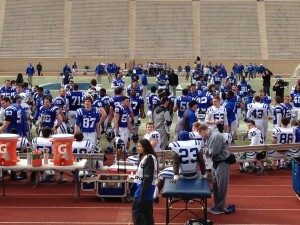 This entry was posted in Duke Football by pmiller55. Bookmark the permalink.